Investec is an international specialist banking and asset management group. For their Dublin headquarters, Investec required an elegant solution to greet visitors to their reception area, as well as convey information to staff members. 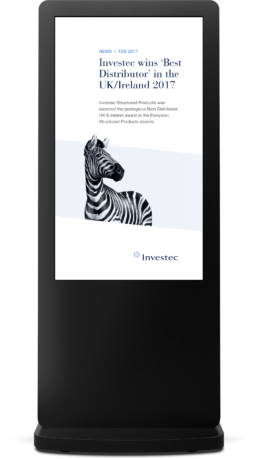 We sourced a sleek digital totem and designed a series of content-managed screens that align with Investec’s distinctive branding, ensuring a welcoming experience for visitors and employees alike.